↑ Oates, E. W. (1889) Fauna of British India. Birds. Volume 1. ↑ Hume, A. 1869. Ibis 2 (5): 355–357 (no title). ↑ Grimmett, R., Inskipp, C. & Inskipp, T. 1998. Birds of the Indian Subcontinent. London: A. & C. Black. 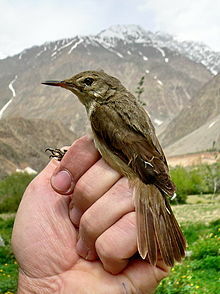 ↑ "'World's least known bird' found breeding in Afghanistan"
↑ ""World's Least Known Bird" breeding site discovered in Afghanistan"